The Caledonian Stadium, technically known as Tulloch Caledonian Stadium for sponsorship reasons is a football stadium located in the Longman Area of Inverness which is the northernmost city in the United Kingdom. 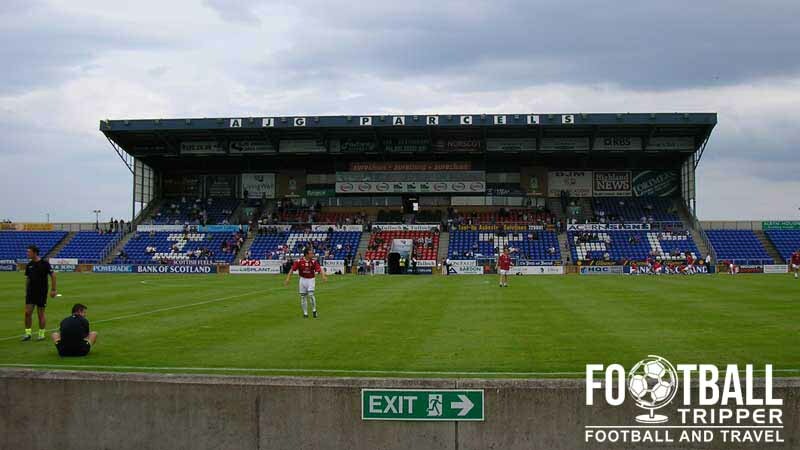 The 7,800 capacity opened in 1996 and is home to Inverness Caledonian Thistle F.C. 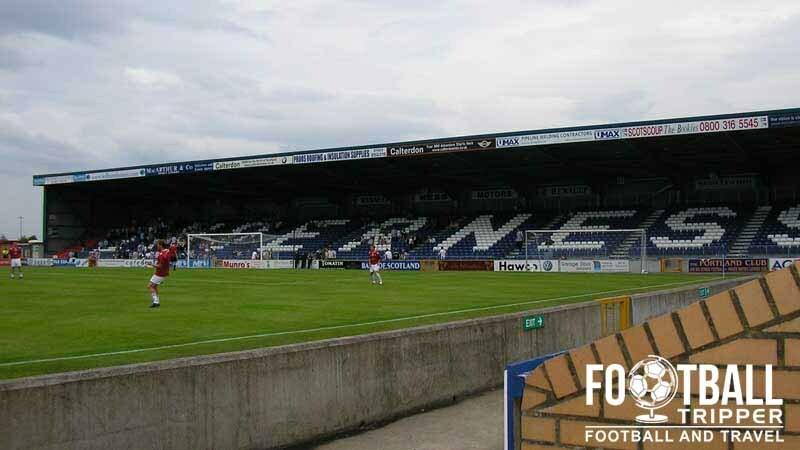 The Caldeonian Stadium was built at a cost of £5.2 million with money raised from the sale of both Caledonian and Inverness Thistle’s former grounds, a grant of £500,000 from the local council, and the remainder from the board, sponsors or supporters. To understand the source of finance for this stadium is to understand the formation of the resident football club with two Highland League Teams Caledonian F.C and Inverness Thistle merging in 1994 in order to increase their chances of entering the Scottish Football League. After initially playing home matches at Caledonian’s former home of Telford Street Park for two seasons between 1994 and 1996, one of the agreements made between the Football League and the newly formed club was that they would move to a newly built ground by August 1995. After exploring four sites including, both constituent club’s former homes a site on East Longman was favoured but opposition was led met by The local Harbour Trust who raised concerns about the floodlights interfering with the navigation of ships entering the Moray Firth. With no resolution impending, the Scottish Football League were forced to extend their deadline to the following season and Caledonian stadium opened in November 1996 with a match between Caley Thistle and North Lanarkshire based side Albion Rovers. In 2004 the young club earned promotion to the Scottish Premier League after winning the First Division Title but immediately failed to satisfy the leagues legislation regarding the minimum capacity of 10,000. Caley Thistle were forced to groundshare with temporarily relocate to Aberdeen and groundshare at the Pittodrie stadium for the first two home matches of the season whilst works were carried out on Caledonian Stadium. Taking just 47 days, the Tulloch Construction Company who are the largest shareholder of the club, added two new stands at either goal end of the ground to increase the capacity to over 7,5000 with the building firm adding a new 400 capacity stand a few seasons later, making them some of the most no-nonsense owners in Football Today. Caledonian Stadium is comprised of four stands: North, East, South and West. 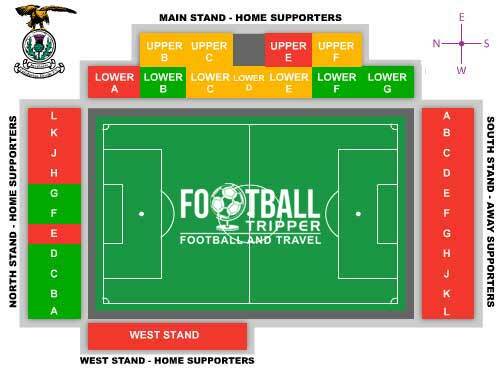 Away fans are housed behind the goal within the south stand with tickets usually available from the travelling club’s official website. For the 2015 season Caledonian operate a two-tier category system with every team falling under category B excluding The Old Firm. Located within an area which is neither residential or commercial in nature, there aren’t too many pubs within 10 minutes of the ground which is why some fans choose to drink in Inverness City centre before hand. One of the most popular bars for home fans is the Inverness Caledonian Thistle Social Club which is located on Greig Street which is on the Western side of the River Ness. As well as having a lively atmosphere the bar also runs transport to the ground which is convenient considering the location. On the eastern side of the river close to the train station there are a good number of traditional boozers which specialise in Ale including the likes of Blackfriars Highland Pub, The Kings Highway and Johnny Foxes to name but three examples. Similar to the pub situation, the city centre has an abundance of dining options which diminish in number as you get closer to the ground. Eastgate Shopping Centre next to the train station is a safe and uninspired choice with the likes of a KFC, Pizza Express, The Noodle Bar, Subway and various Coffee Chains. As the city centre isn’t the largest you could always take a wonder where you will find a number of independent restaurants which cover popular cuisines such as Italian, Chinese and Indian. Within each concourse and outside the stands there are a fair few kiosks and “serveries” which sell the typical matchday fare such as warm food, snacks, sweets, and hot and cold drinks. Inverness Caley operate a club shop at Caledonian Stadium in addition to an official online store. Matchdays: 9.00 am until kick-off and then after the match for an hour so. Inverness Caledonian Thistle fans celebrating the team scoring a goal. It doesn’t appear as if The Jags currently offer fans the chance to undertake a guided tour of Caledonian Stadium, however if this every changes we’ll be sure to update this section. Tickets to see ICT FC play football at Caledonian stadium during the 2015 season are priced within two categories A and B, however Category A currently only refers to matches against Celtic since I’m guessing Rangers were relegated. Tickets can be purchased via the usual channels including online via eTicketing, in person at either the ticket office or club shop and via phone 01463 227451. 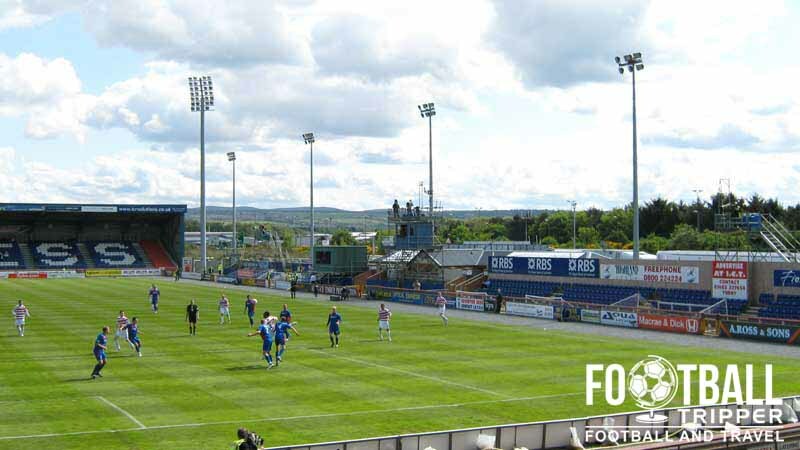 Caledonian Stadium is located within the Longman Industrial area of Inverness within the Moray Firth. The main stand as seen from outside. Located within an Industrial area there are a decent amount of on-site parking spaces around the ground for fans who wish to travel by car. Inverness Railway Station is located approximately 1.5 miles away from the stadium, with the resulting journey by foot likely to take the average person no more than 30 minutes. Caledonian stadium can be reached by following Longman Road northwards towards the coast. The main entrance gate of the stadium. There is a bus day service which takes fans from the city centre to the stadium on matchdays. Departing at Farraline Park bus station just outside from the train station this is a cheap and popular way to get to the ground before the match. There is a taxi rank located outside of the railway station as well as at the nearby bus stop. 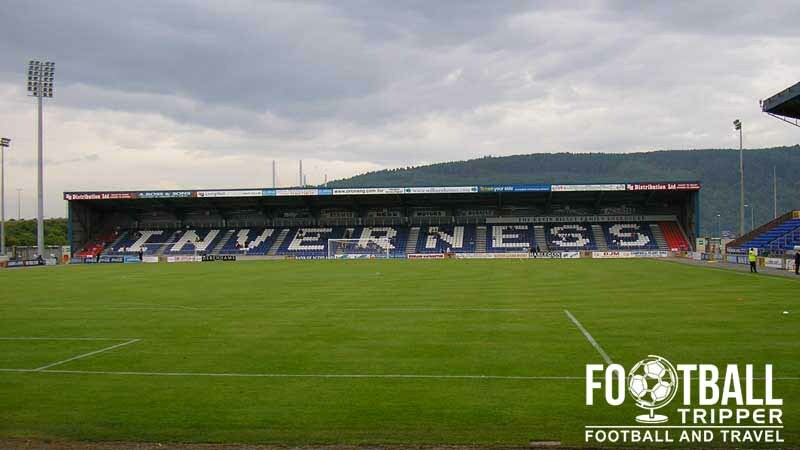 There are no hotels within the immediate vicinity of the stadium with every accommodation located back within Inverness City centre. Here there is the likes of a Premier Inn, The Royal Highland Hotel and Pentahotel all of which can be found just behind the train station.